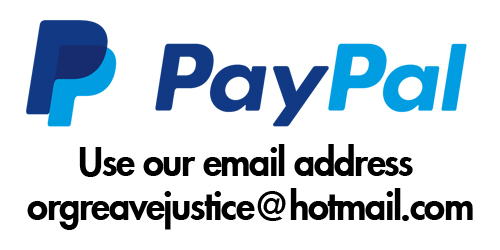 The Orgreave Truth and Justice Campaign would like you to ask your Council to pass a resolution / motion to support the Campaign and contact the Home Secretary to ask him to order a Public Inquiry into the events at Orgreave on June 18th 1984. We have received magnificent support from a number of Councils throughout the country and are hoping that we can get much more support to help us succeed with our request for an Inquiry. We have also received a lot of support from many Labour Party, Trade Union colleagues and branches and political and social justice organisations throughout Britain showing that this is not just an issue affecting the north of England. Please see the list of councils already on board below our model resolution. This Council is concerned and disappointed by the previous Home Secretary’s rejection on the 31st October, 2016 of an Inquiry into the policing of events at Orgreave. This Council notes, since this decision was taken, a new Home Secretary, Sajid Javid, is now in office. This Council is pleased to note the decision by the Scottish Parliament on 7th June 2018 to order an independent review to investigate and report on the impact of policing on affected communities in Scotland during the period of the miners’ strike from March 1984- March 1985. This Council further praises the decision of the Welsh Assembly on 12th June 2018 to write to the Home Secretary, Sajid Javid, to ask for an independent review into policing in England and Wales during the miners’ strike, and on 13th June 2018 to also write again asking that the Home Secretary orders an inquiry specifically into the policing at Orgreave on 18th June 1984. This Council asks, in the light of such statements from the Scottish and Welsh government, what the new Home Secretary, Sajid Javid, has done since these statements, to take these into account and express his views, on a full public inquiry into the events at the Orgreave coking plant on 18th June 1984. This Council notes that 95 miners were arrested and charged with offences, but were all later acquitted amid claims that police at the time had fabricated evidence. This Council observes that the Independent Police Complaints Commission said about Orgreave on 18th June 1984 in their report released in June 2015 “that there was evidence of excessive violence by police officers, and a false narrative from police exaggerating violence by miners, perjury by officers giving evidence to prosecute the arrested men, and an apparent cover-up of that perjury by senior officers”. This Council is of the view that the Home Secretary needs to acknowledge the action of the Scottish government and the call from the Welsh government and confirm his response. This Council will write to the Home Secretary and ask that he acknowledges the response of the Scottish and Welsh Parliaments, explains what action he has taken in response and takes into account the opinion of this Council and accepts that there is widespread public concern about events at Orgreave and calls for him to order an inquiry into them. Please view the link below of Derby City Council full council meeting , with a motion on the agenda deploring Amber rudd’s decision not to hold any type of inquiry into the events at the Orgreave Coking Plant, edge of Sheffield and Rotherham 18/6/84 when 95 miners were arrested and falsely charges with riot and unlawful assembly. the debate starts approx 38 minutes into the meeting with the motion proposed by Labour councillor Paul Bayliss and seconded by Labour Councillor Anderson. the motion was passed unanimously along with strong vocal support from the public gallery from an ex miner. We done it, we got the motion passed. 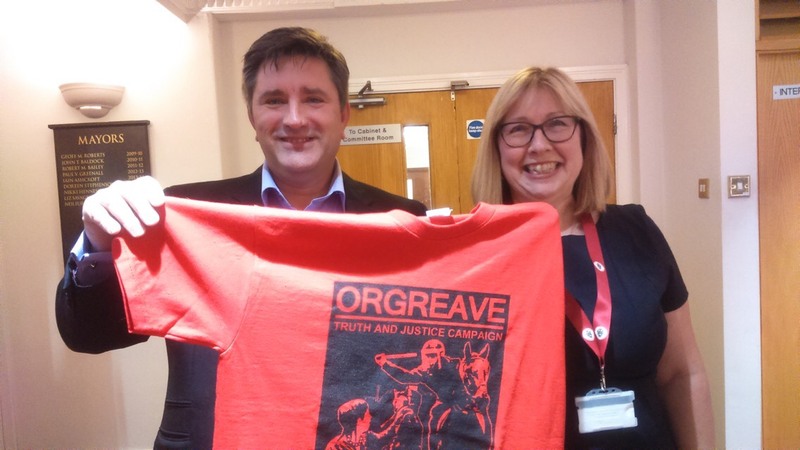 Claire moved the motion and I do believe we are the first Labour group in Lancashire and maybe this side of the Pennines to push the Orgreave Truth And Justice Campaign. We had a double result as the Tories walked out on mass on the previous Motion. They showed their true colours. Appalling behaviour by the Conservative Group at West Lancs Borough Council A staged walk out refusing to engage with motions on the low pay of public sector workers, the impact of taxation on small businesses, Justice for Orgreave miners, WASPI women and a Minister for Older people. Obviously nothing of importance to the Conservative Group. They don’t want to debate and don’t feel they have to represent their constituents. Very poor. This Guys should give us maximum exposure in the press. A result. COUNCILLOR S McKENNA: Pleasure to ask this. Please can the Leader of Council confirm if she supports the Orgreave Truth and Justice campaign? THE LORD MAYOR: Councillor Blake. COUNCILLOR BLAKE: Thank you, Lord Mayor. Councillor McKenna. 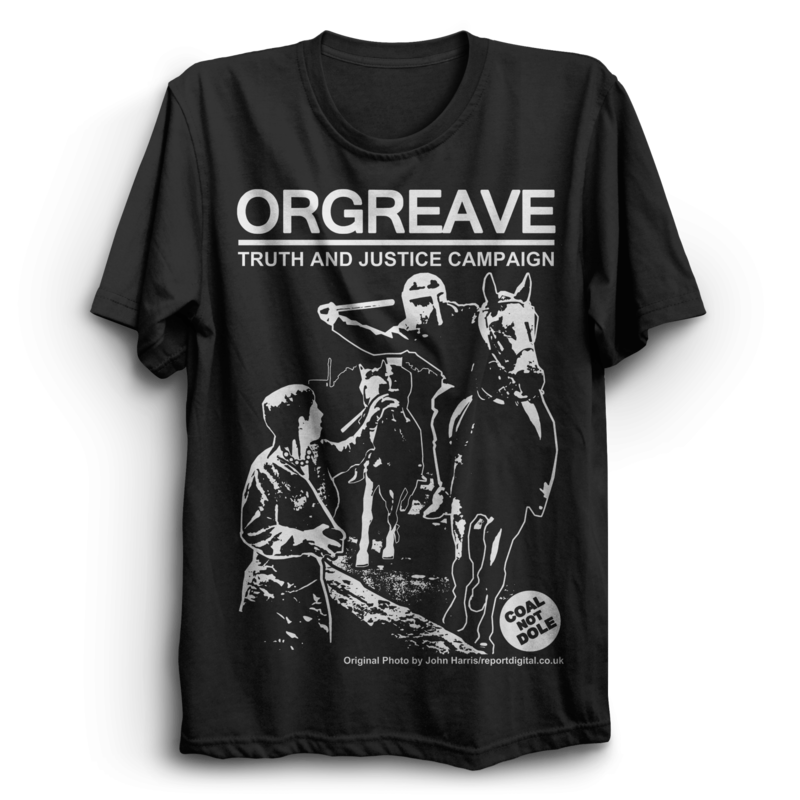 Yes, I can confirm that I support the Orgreave Truth and Justice Campaign. 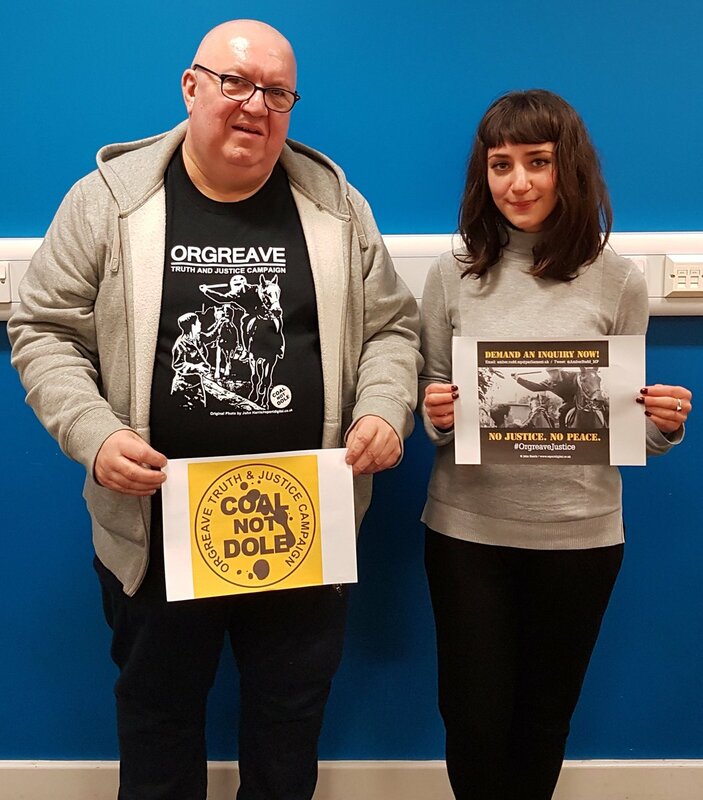 All colleagues will be aware that many people from Leeds supported the Miners’ Strike back in the early 1980s, not least those who lived in former mining communities in this city but also those who were on the picket line at Orgreave Coking Plant on 18th June in 1984. Many Members of this Council at the time worked tirelessly to support the families involved in the strike at that particular time. At the end of October last year the Home Secretary ruled out an inquiry into the events of that dreadful day. To say that this is a disappointment to those former mining communities and all those who support the Orgreave Truth and Justice Campaign is an understatement. Can I remind everyone in Council, the campaign is strictly non-political and welcomes support from all those with genuine concern, particularly around the deception and covering up of events that happened at Orgreave that day. I think all of us only have to look at the footage of the events of that day to know something was very, very seriously wrong. 95 miners who took part in a peaceful picket were arrested and charged with riot offences – later all acquitted among claims that the police had fabricated evidence. There were also claims that police attacked the peaceful protestors. Miners suffered this just for exercising their right to protest against the threat to their jobs, their industry and their communities. The redacted report of the Independent Police Complaints Commission released in June 2015 found evidence of excessive violence by police officers, a false narrative from police exaggerating violence by miners, perjury by officers giving evidence to prosecute the arrested men and an apparent cover up of that perjury by senior officers. In the light of these statements it is very surprising indeed that the Home Secretary does not think there are any lessons to be learned from any review of these events and in such close proximity to the inquiry and Inquest into Hillsborough, this is very surprising indeed. Let us think about those miners, their wives and their families who suffered so much at the time and all that has been left of their reputation as the years have gone by. THE LORD MAYOR: Councillor McKenna, have you got a supplementary? The full transcript of the meeting is available at the link below (the information about OTJC is included on pages 45 and 46). Notice of Motion – Policing of Events at Orgreave To be moved by Councillor John Warmisham and seconded by Councillor David Lancaster. In October 2016 the Home Secretary’s rejected calls for an inquiry into the policing of events at the Orgreave Coking Plant, South Yorkshire on 18th June 1984 during the UK Miners Strike of 1984/85, Following this, at their meeting held on 18th October 2017, West Lancashire Borough Council, agreed a resolution expressing concerns at the decision of the Home Secretary and asking her to reconsider it. This Council is asked to support the actions taken by West Lancashire Borough Council, by joining with them and; (i) Expressing disappointment at the Home Secretary’s decision. (iii) Noting that 95 miners were arrested and charged with riot offences, but were all later acquitted amid claims that police at the time had fabricated evidence. (iv) Agreeing in the light of such statements, the Home Secretary needs to review her decision that, there should be no inquiry into such events. (v) Requesting that, the City Mayor and the local MPs, namely Barbara Keeley, Rebecca Long-Bailey and Graham Stringer, all write to the Home Secretary and asks that she takes into account the opinion of this Council and accepts there is widespread public concern about events at Orgreave and calls for her to reverse her original decision and to now order an inquiry into them. Seconded by Councillor Brian KennyThis Council is concerned and disappointed by the Home Secretary’s rejection on the 31st October, 2016 of an Inquiry into the policing of events at Orgreave. This Council observes that the Independent Police Commission said in their redacted report released in June 2015 “that there was evidence of excessive violence by police officers, and a false narrative from police exaggerating violence by miners, perjury by officers giving evidence to prosecute the arrested men, and an apparent cover-up of that perjury by senior officers”. This Council believes in the light of such statements that the Home Secretary needs to review her decision and ensure that there is a full public inquiry into the events at the Orgreave coking plant on 18th June 1984. Council agrees to write to the Home Secretary and ask that she takes into account the opinion of this Council and accepts that there is widespread public concern about events at Orgreave and calls for her to order a public inquiry into them. Having applied the guillotine in accordance with minute 99 ante, the Council did not debate this matter. Prior to the motion being put to the vote, Councillor Blakeley and five Conservative Members rose to request a ‘card vote’. 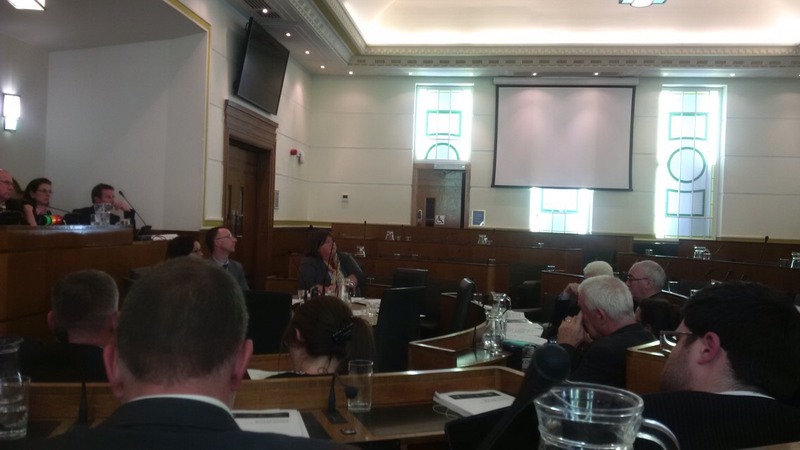 For the motion (53) Councillors R Abbey, T Anderson, B Berry, C Blakeley A Brighouse, P Brightmore, D Burgess-Joyce, C Carubia, P Cleary, A Davies, G Davies, P Davies, P Doughty, D Elderton, G Ellis, S Foulkes, P Gilchrist, J Green, P Hackett, P Hayes, A Hodson, AER Jones, C Jones, S Kelly, B Kenny, A Leech, I Lewis, M McLaughlin, J McManus, C Meaden, B Mooney, C Muspratt, T Norbury, C Povall, D Realey, L Reecejones, L Rennie, L Rowlands, PA Smith, C Spriggs, J Stapleton, P Stuart, M Sullivan, A Sykes, T Usher, J Walsh, W Ward, G Watt, S Whittingham, I Williams, KJ Williams, J Williamson and G Wood.